I’ve had this camera for less than a week. Sent to me on loan from Ricoh, I’m madly trying to get my head around it before I have to send it back. This blog post consists of a short review, my first impressions and of course my unadulterated opinion. Although simple to operate, I’m still climbing a steep learning curve. Especially when it comes to workflow. Some browsers just aren’t ready yet. Not to mention traditional editing software. This is sure to change though. And soon. This is a device so different from anything else I have played with. I think it will be a while before I’m even close to grasping the creative potential. I’ve been gleaning some tips from earlier adopters. @Kosso has been knee deep in code, researching and creating apps and spaces where the content from this strange device can be shared. 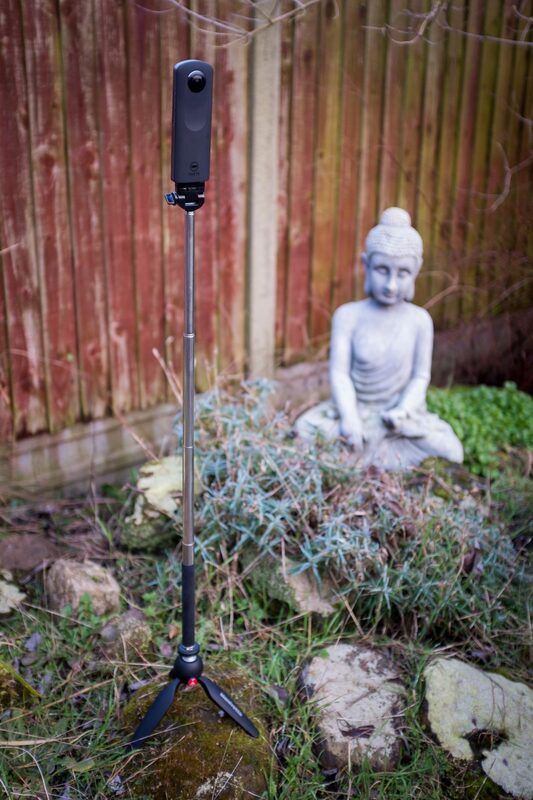 I’ve also been dropping by Rupert Howes’s blog to see how he is using his Theta S.
Measuring 43mm x 130mm the ThetaS is Ricoh’s updated twin-lensed 360 degree omnidirectional camera. This is their third iteration. They have good momentum right now. It’s a decent place to be as other consumer friendly devices are about to hit the market. Cameras offering a 360 degree field of view are not new though. They’ve been used in robotics, surveillance and teleconferencing for many years. The first truly consumer device I became aware of was by British inventor Tom Lawton. His BubbleScope is still around. Now priced at £25 it’s a mirror attachment you clip to your phone. The Theta S captures 14 megapixel spherical panoramic stills. It can also capture full HD (1,920 x 1,080 at 30fps) for a maximum of 24 mins with it’s 8gb of onboard storage. But good luck uploading that at roughly 100mb/min. It has decent sized sensors but in my opinion the quality of the stills outweigh the video. The video captured is a distorted 360 x 180 degree image. To make any sense of the information you need to focus on small areas of it. Both the Theta360.com site and YouTube do a great job of this. Richo’s own site also allows you to zoom into the video. The 14 megapixel output is captured via two 12 megapixel sensors. A good size for a still photo but remember those pixels are capturing the image across a huge area. The two lenses capture 190 degrees each. This enables them to see behind themselves for better image stitching. Exposure control is available but limited to a simple slider. I’ll be interested to see if newer apps will offer more manual options. When holding the camera your body will always get in the way. With close-up chunky fingers at the bottom. Fine if you intend to be in every shot. Not so good if you are capturing a landscape or street scene and you don’t want to be the main focus. I overcome this by using a tiny Joby micro tripod. It’s more of a folding three footed stand than a tripod, but it got me out of the shot. The ThetaS connects via AdHoc wifi to the phone and the shutter is best triggered from there. You can take multiple shots but there is a long delay between each. Shooting images on the little stand had it’s limitations. I felt I needed something with more height. A selfie stick is perfect for this, providing it’s threaded on the bottom. Not being a huge fan of selfie sticks outside of action sports I think this is the best use yet. I popped to Jessops (yes you can still find them) to buy one. Once the humiliation had subsided, I attached the cheap selfie stick to a small Manfrotto tripod. It works well. Maximum hight from floor to lens is about 120cm. Be warned though. Everything is in shot and on display. Every nook and cranny of a room. Every post-it note with a password scribbled on it. It may be distorted but this can be warts ’n’ all photography. I found I could transfer an image to my phone for editing and then upload via the ThetaS app with no issues. Handy if journalists have to pixelate faces in a crowd. At £300 The ThetaS doesn’t sound cheap. But look at some of the 6 to 12 Go-Pro rigs and it’s a bargain. At a fraction of the price where the Theta S offers less in the way of video quality, it more than makes up with convenience. It’s good to go out of the box. It also doesn’t need a supercomputer to process the files. It feels top quality in the hand but also vulnerable. With the two protruding fisheye lenses I would not want to drop it onto any surface. Keep it in the handy pouch when not in use. The simplicity of a single device is what makes this appealing. It’s also accessible to those familiar with capturing video on their phone. There is no landscape or portrait argument any more. You can have it all at once. Video: The options are fiddly at the moment. Ricoh’s main app offers basic trimming functions but I struggled getting it into YouTube. I imported the video from the camera using iPhoto. Then using the downloadable Mac app from Ricoh, convert the strange duel lensed view to Equirectangular. You can then upload straight into youtube. If you crop or edit the video in any way you’ll need to re-inject the metadata. I used 360 Video Metadata Tool before uploading to youtube. Then it was a little wait for youTube to process the 360 data. Once uploaded to YouTube, view in a compatible browser. You will be able to click and drag around the video viewing all angles. WASD keys also work. 360 video can’t yet be viewed in the mobile Safari browser. On a smartphone in the YouTube app you can move the phone to physically look around. Some phones and apps may also let you select a google cardboard mode for tracking your head movements. Great for the fully ‘immersed’ experience. And if you can find it the official ThetaS app will do cardboard view too. Photos: I managed to edit on the phone and uploaded to the Theta360.com with no issues. If you are editing still images in Photoshop I’m told you need to copy the exifdata from the original image onto the edited version. Other things to consider with the ThetaS. Great image quality for the price. 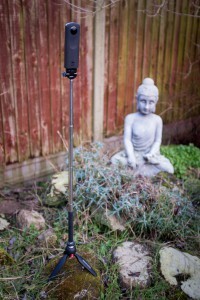 Simple interface has you capturing 360 degree panoramic images in no time. A fast developing SDK and ecosystem with many new apps on the way. Camera can be held at any angle. 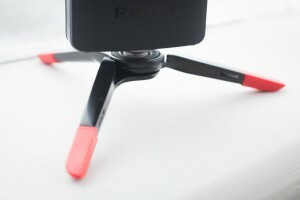 The inbuilt accelerometer and compass will right-correct the horizon in images or video. Some 360 cameras stitch the images in the cloud. The ThetaS does everything onboard. Exposed microphone performs badly outdoors. It’s dependent on a decent smartphone for full operation and access to settings. Video needs plenty of light to be of decent quality. Battery or memory cannot be changed. The exposed bulbous lenses need covering when not in use. In my opinion Ricoh has got a decent head start on the opposition with the ThetaS. An amazing piece of technology for the price. This is the first 360 camera I have seen that had me feeling it’s time to get involved. Now I’ve had a play I’m hooked. It’s still early days for the software and hosting options but we are on the edge of something big. A new photographic era is certainly upon us. We once explored the world with our photography and squeezed three dimensions into two. Now we can explore both the world and our three dimensional reflections of it. The creative possibilities are endless. This will not replace 2D imagery. It’s another wonderful tool at our disposal as we capture, share and try to understand the world around us. A really good review and it’s re-sparked my interest in 360 photos. I used to be quite active on Panoramio (http://www.panoramio.com/user/281956) and enjoy logging places and landscapes for others to experience. 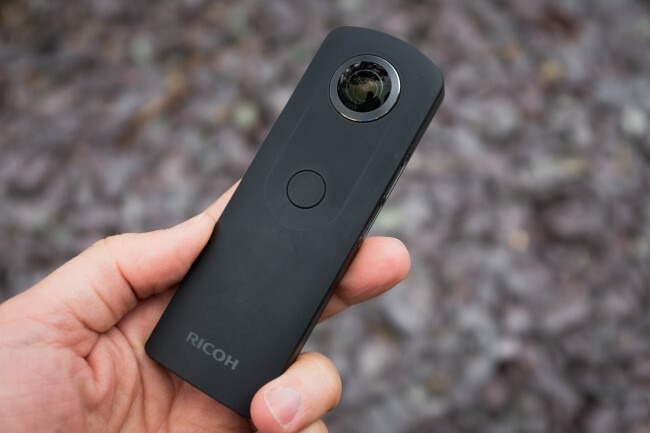 The ease of a one click 360 photo on an affordable device makes logging places even easer and will save time over using the Google Street View 360 app. I’d be really interested in using a Theta S for this. Hi Dan, I dropped it on my Motorbike the other day and it seemed to hold out well. Even at speed. I’m yet to upload it.